• Added experimental support for a supported-color-schemes CSS property (r238001). • Changed the default document background and text colors in dark mode and when dark is listed as a supported-color-schemes on the document or body element (r238212). This is actually talking about a new meta tag <meta name="supported-color-schemes"> and a CSS property supported-color-schemes that were both proposed in a CSS WG GitHub issue. 💡 Before I continue, let me briefly describe what a user-agent stylesheet is: a user-agent (UA for short) stylesheet determines the default look and feel of a page. As the name suggests, a UA stylesheet is something that is dependent on the UA in question. You can have a look at Chrome’s (and Chromium’s) UA stylesheet and compare it to Firefox’s or Safari’s (and WebKit’s). 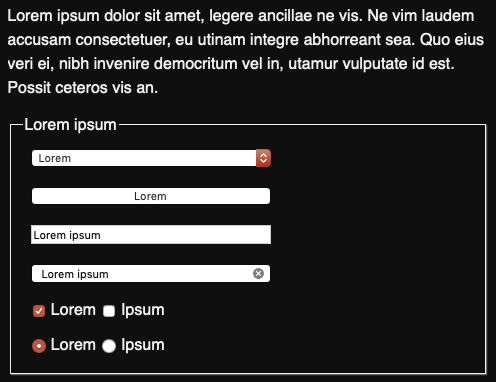 Typically, all UA stylesheets agree and make texts black and background colors white, but there are also differences, for example, how to display form controls. Side remark: To overcome these differences, CSS normalizers and CSS resets have become a thing (read this article about the difference). 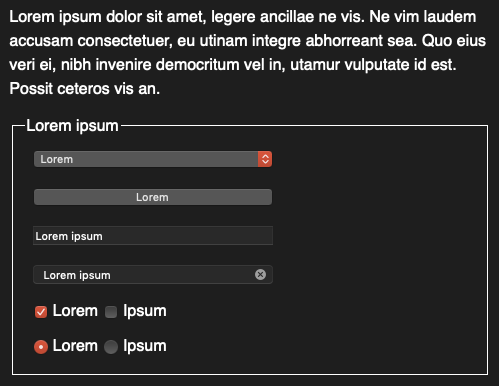 Note that there is no custom CSS at all included, let alone the @media (prefers-color-scheme) media query. The above is purely based on the UA stylesheet. The meta tag <meta name="supported-color-schemes"> and the CSS property "supported-color-schemes"
Now back to the meta tag and the CSS property (that has the same behavior as the meta tag, but optionally limited to just subsections of a page). They both mean that UAs know early in parsing which color scheme is to be used, since this may impact the default appearance, for example, when rendering the default page background, form controls, the default selection color, but also other UA-controlled UI like misspelling underlines. In consequence, this avoids flashes caused by delayed switches between color schemes. light dark—The UA will choose the light or dark theme to match the user’s preference. If the user’s preference does not match something in the list, the UA is allowed to apply transformations to the content. only (synonym for light only—The UA will only ever render the content in the light color scheme, and never apply transformations. light dark only—The UA will choose the first of the listed schemes that it supports taking user preference into account, and never apply transformations. So iff (if, and only if) you know what you’re doing, in combination with only, you can then design things like your form controls to have no such transformations. In most cases, leaving it to the UA might be the better choice, as you can see in the example below, where, while in dark mode, I force my form controls to look like light only. Left: glaring and without transformations. Right: the easier-on-the-eyes UA default.